The village of Forteviot in Perthshire was once the capital of the Pictish province of Fortreen. It became the royal palace of the Picts until they were defeated by Kenneth MacAlpine in 843. This victory resulted in the eventual union of the Scots and Picts into one kingdom. After MacAlpine’s death in 860 it remained a favorite residence of Scottish kings. 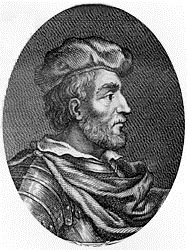 Duncan I became king of Scots on the death of King Malcolm II, his maternal grandfather, in late 1034. During his reign (1034-1039), one of his royal palaces was located on a small hill to the northwest of the village of Forteviot. One evening when returning from a hunting expedition, he was separated from his retinue and stopped at a mill beside the River Earn near Forteviot. The miller and his family entertained their guest with equal pleasure and pride and King Duncan stayed the night. Duncan kept up the acquaintance with the miller’s family and Nell the miller’s daughter became Duncan’s leman (mistress). Their union produced a son, Malcolm, born in March 1031 in Dunkeld. This son’s proud grandfather was Crinan, Abbot of Dunkeld. Crinan was killed in 1045 in a failed attempt to put his grandson on the throne. Malcolm eventually became king of Scots (1058-1093). During his 35 year reign, Malcolm III (Canmore), used the palace as a hunting lodge. Marshall, William "Historic Scenes in Perthshire", Edinburgh, 1880, p 103. McKerracher, Archie "Perthshire in History and Legend", Edinburgh, 2000, p 212.